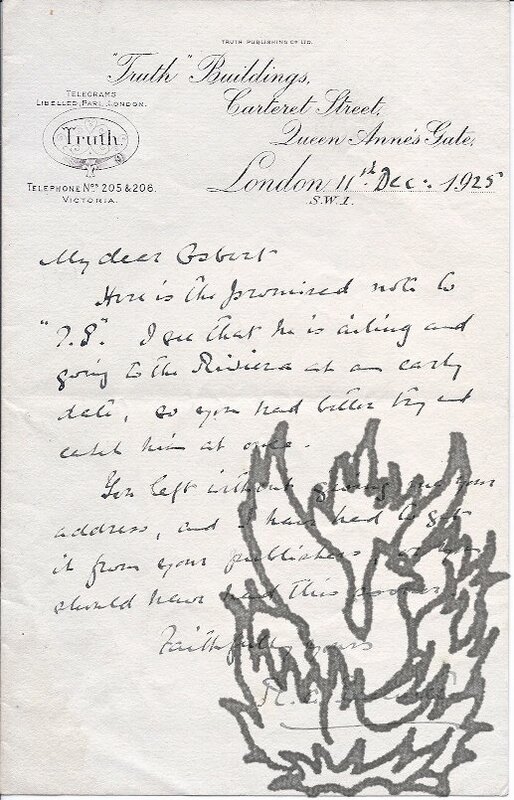 Autograph Letter Signed ('H Niles') from Hezekiah Niles to an unnamed subscriber to his newspaper Niles' Register, complaining of the conduct of 'Mr Kollock', one of the agents who have caused all of Niles' 'difficulties of a pecuniary nature'. 1p., 4to. Good, on lightly-aged paper, with a small hole caused by the breaking of the seal, affecting one word of text. 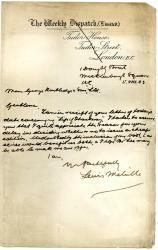 Niles acknowledges receipt of a 'very friendly letter'. 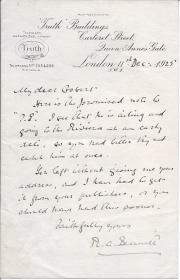 'My collector has returned, & you already had <?> for the 10$ to Sept. 1818'. Niles considers 'Mr Kollock's conduct, for a man of his standing, [...] very extraordinary - he has other monies of mine, besides the 5$ that you paid in his possession, which it does not suit his convenience to refund. No. 1. Saturday, November 15, 1884. [Printed and Published for the Proprietors by J. C. DURANT, Clement's House, Clements Inn Passage, London, W.C.
Broadsheet, 8 pp. A single sheet, folded twice and unopened. No stapling. Text clear and complete, on aged and spotted paper (not high-acidity newsprint), with wear and chipping to extremities. Articles include 'The American Elections' by Henry George; ''The Crofter Revolt', and 'The "Pall Mall Gazette" Panic'. Also 'Metropolitan Constituencies No. I. - Hackney'. Scarce: no copy at the British Library (Colindale) and the only run on COPAC at the University of London. Autograph Letter Signed ('Lewis Melville') to Messrs George Routledge & Sons, Ltd.
5 August 1903; 1 Doughty Street, Mecklenburgh Square, W.C., on cancelled letterhead of the Weekly Dispatch. 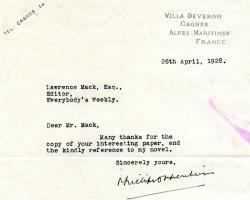 Typed Note Signed ('Phillips Oppenheim') to Lawrence Mack, editor of Everybody's Weekly. 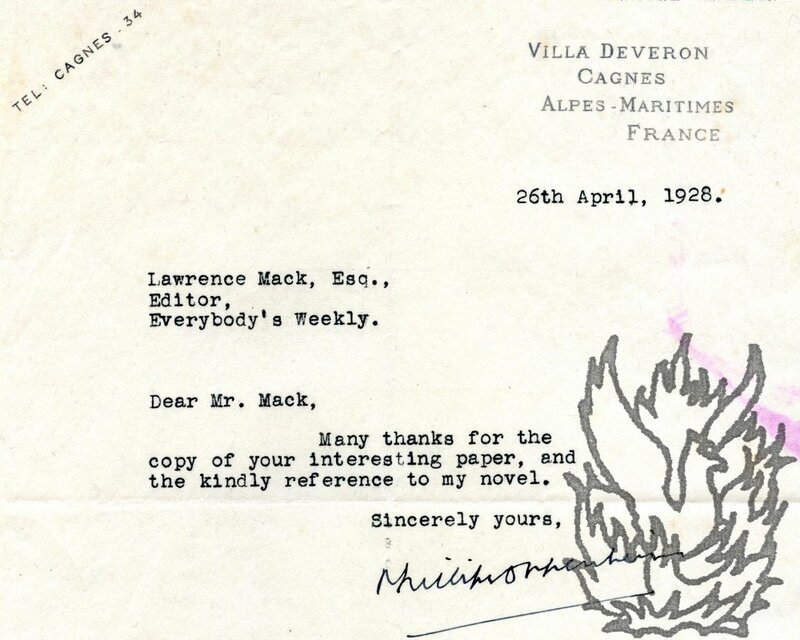 26 April 1928; on letterhead of Villa Deveron, Cagnes, Alpes-Maritmes, France. Printed publicity material relating to the insertion of an advertisement in 'The Manchester Weekly Times'. Undated [late Victorian]. Place [Manchester] not stated. The main text is printed on one side of a piece of paper roughly 28 x 13.5 cm, headed 'Upwards of Thirty Thousand Copies Of the "Manchester Weekly Times," with Eight-page Literary Supplement, are Issued Every Saturday.' The main block of text, in a variety of types and point sizes, consists of 27 lines ending 'The Proprietors respectfully solicit instructionsn to insert your Advertisement.' Describes the newspaper's merits and boasts that it is 'one of the Largest and most complete Weekly Papers published'. Prospectus for the New Series of "Once a Week"
Bradbury & Evans, London, . Pamphlet, pp., 8vo, formerly sewn but thread missing, hence leaves loose, good condition. It advertises new works (for example, "A New Novel, by the Author of 'Guy Livingstone'") but is notable for its lists of contributing Authors and Artists, and "Classified Index of all the Principal Articles in Prose". 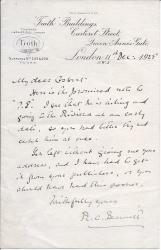 18 November 1927; on letterhead of the Advertiser's Weekly ('THE ORGAN OF BRITISH ADVERTISING'). Naval author and journalist (died 1942). One page, quarto. Discoloured with age and with a few closed tears but in good condition overall. Docketed and bearing the Society's stamp. 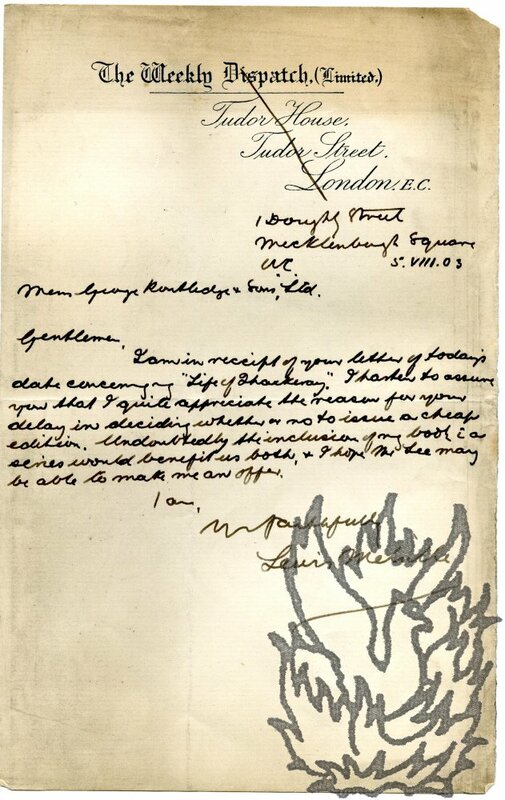 'I should be obliged if you could let me have copies of any promotion matter which you have put out in recent years for the purpose of attracting artists to enter competitions for poster designs.' Signed 'H. C. Ferraby' ('EDITOR'). Victorian writer and humorist. Difficult handwriting. 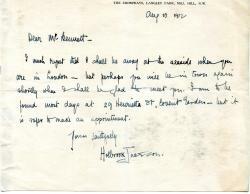 'My dear Sir/ | Will Monday be equally convenient to you? 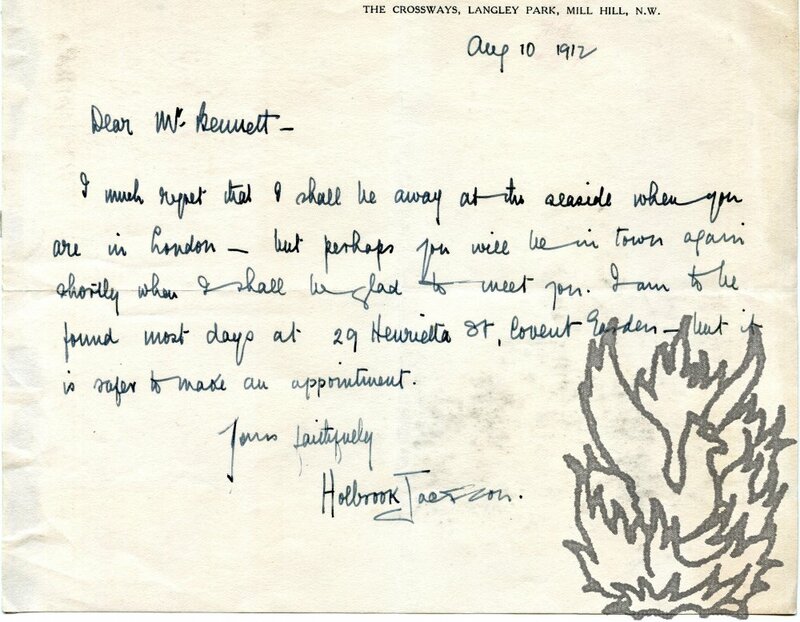 If no I shall be happy to see you either here or in town, as shall best suit your leisure.' Docketed with large underlined '2' in blue pencil, creased and discoloured. Blank second leaf damaged by removal from album, and with glue stains and remains of blue paper.